Advance your career by receiving valuable resources, discounts on meetings, a voice on relevant legislative issues and more. The LA CRNA PAC fights to preserve quality healthcare in Louisiana and promotes the opinions and needs of Louisiana's CRNAs to the members of the State Legislature. Please click here to learn more and help support this important cause. Summit participants discuss data related to their communities from the County Health Rankings & Roadmaps report. 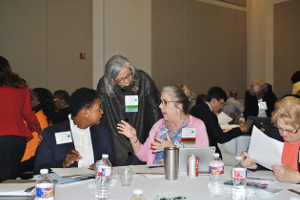 A diverse group of healthcare professionals, business, governmental and community leaders and other interested stakeholders from across the state gathered on April 5 in Baton Rouge to gain insight about the state of health of Louisianans and discuss ways to address major health disparities and promote health equity in our state. “Where we live matters to our health,” said Julie Willems Van Dijk, PhD, RN, FAAN. Willems Van Dijk is Deputy Director for the Robert Wood Johnson-funded County Health Rankings & Roadmaps project at the University of Wisconsin Population Health Institute (www.countyhealthrankings.org). The annual County Health Rankings are based on health outcome measures related to length of life (50%) and quality of life (50%) and measures of health factors related to health behaviors (30%), clinical care (20%), social and economic factors (40%), and physical environment (10%). The findings are published each year and are used by organizations and communities across the country to devise ways to help close the health gaps between those with the most and least opportunities for good health. Prior to Willems Van Dijk’s presentation, Parham Jaberi, MD, MPH, Assistant Secretary for the Office of Public Health (OPH) at the Louisiana Department of Health, spoke to the group about OPH’s strategic priorities which included increasing immunization coverage amongst children and tackling the state’s high sexually transmitted infection and HIV rates. Stephen F. Wright, Senior Vice President of Group Operations for CHRISTUS Health, addressed issues related to diversity and inclusion in our current healthcare system and shared strategies used within the CHRISTUS Health System to promote health equity. David Zuckerman, MPP, Director of the Healthcare Engagement Democracy Collaborative, presented community wealth building as a way to address health inequities. Other panel members included Jared Hymowitz, director of the Mayor’s Healthy BR initiative; Jeanne Solis, CCO with the Terrebonne Chamber of Health Leadership Alliance; and Charlotte Parent, BSN, RN, MHCM, Assistant Vice President, Community Affairs/Network Navigation, LCMC Health, BUILD Health Challenge. Building a Culture of Health is a movement led by the Robert Wood Johnson Foundation and shared with others to take on one of the most pervasive challenges of our time: improving the health and well-being of every one in America. A Culture of Health places well-being at the center of every aspect of life, so that all communities can flourish and all individuals thrive, regardless of race, creed, income, or location. It’s built on the premise that everyone deserves to live the healthiest life possible. LAC, is one of 51 state action coalitions including the District of Columbia supporting the Future of Nursing: Campaign for Action, a national initiative to guide implementation of the recommendations in the landmark Institute of Medicine report, The Future of Nursing: Leading Change, Advancing Health. The report, released in October 2010, includes recommendations for a variety of system improvements including proven, solution-oriented ways to address the nursing and nurse faculty shortage in the U.S. The Campaign envisions a health care system where all Americans have access to high-quality care, with nurses practicing to the full extent of their education and training. As the largest group of health care professionals, nurses will play a key role in building a culture of health. Summit partners: AARP Louisiana, Humana, Louisiana State Board of Nursing / Louisiana Center for Nursing, Louisiana Department of Health, Louisiana Public Health Institute, Louisiana State Nurses Association, LSU School of Nursing New Orleans and Our Lady of the Lake Regional Medical Center. Platinum sponsors: AARP Louisiana, LCMC Health, Louisiana Department of Health Division of Community Preparedness, Our Lady of the Lake Regional Medical Center and UnitedHealthcare. Gold sponsors: Baton Rouge District Nurses Association, Healthy Blue, Louisiana Public Health Institute and New Orleans District Nurses Association. Silver sponsors: Gifted Healthcare, National Cervical Cancer Coalition, Louisiana Patient Safety Initiative, Louisiana State Nurses Association District IV and Ochsner. Learn more about the Louisiana Action Coalition at www.louisianafutureofnursing.org. Read about colleagues who have recently passed away. 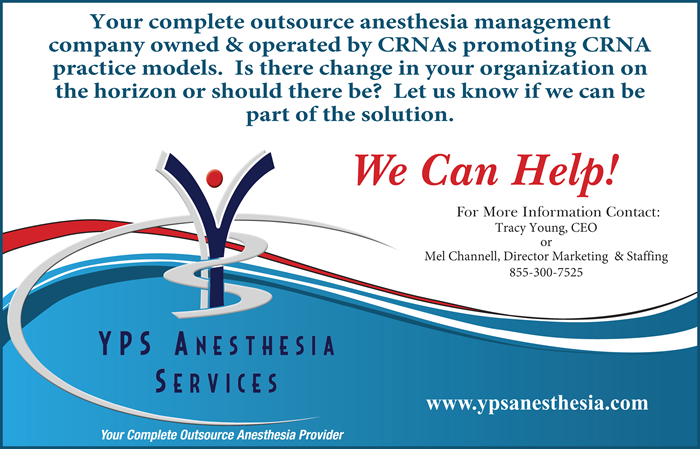 Please submit information on CRNAs who have recently passed away to: office@lanacrna.org.